, bishop of Ypres, principal of the sect called Jansenists, was born in a village called Akoy, near Leerdam in Holland, of Roman Catholic parents, John Ottie and Lyntze Gisberts and, having had his grammar-learning at Utrecht, went to Louvain in 1602, and from that to Paris, where he met with John du Verger de Hauranne, afterwards abbot of Saint Cyran, with whom he had contracted a very strict friendship. Some time after, du Verger removing to Bayonne, he followed him thither; where, pursuing their studies with unabated ardour, they were noticed by the bishop of that province, who, conceiving a great esteem for them, procured du Verger a canonry in his cathedral, and set Jan sen at the head of a college or school. He spent five or six years in Bayonne, applying himself with the same vigour to the study of the fathers, St. Austin in particular; and, as he did not appear to be of a strong constitution, du Verger’s mother used sometimes to tell her son, that he would prove the death of lhat worthy young Fleming, by making him overstudy himself. 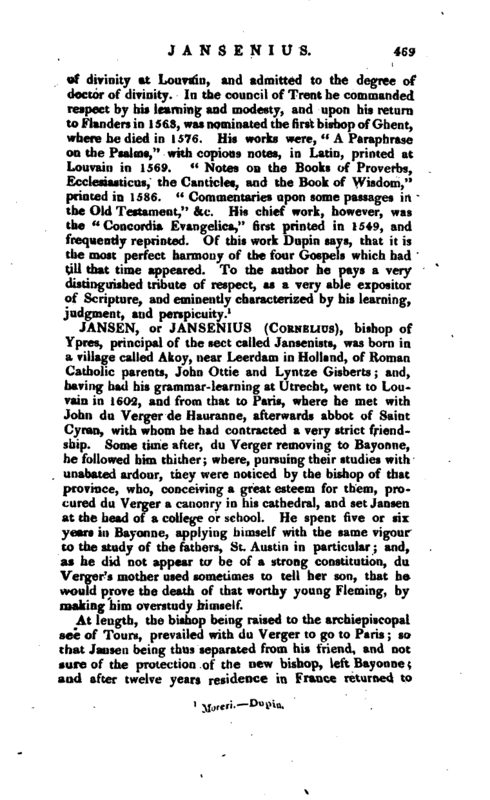 At length, the bishop being raised to the archiepiscopal see of Tours, prevailed with du Verger to go to Paris; so that Jansen being thus separated from his friend, and not sure of the protection of the new bishop, left Bayonne; and after twelve years residence in France returned to | Louvain, where he was chosen principal of the college of St. Pulcheria. But this place was not altogether so agreeable, as it did not afford him leisure to pursue his studies so much as he wished, for which reason he refused to teach philosophy. He took his degree of D. D. in 1617, with great reputation, was admitted a professor in ordinary, and grew into so much esteem, that the university sent him twice, in 1624, and the ensuing year, upon affairs of great consequence, into Spain; and the king of Spain, his sovereign, made him professor of the Holy Scriptures in Louvain, in 1630, notwithstanding the Spanish inquisition lodged some information against him in 1627, with Basil de Leon, the principal doctor of the university of Salamanca, at whose house he lodged, asserting that he was a Dutchman, and consequently an heretic; but Basil answered them so much to the advantage of Jansen, that his enemies were disappointed. 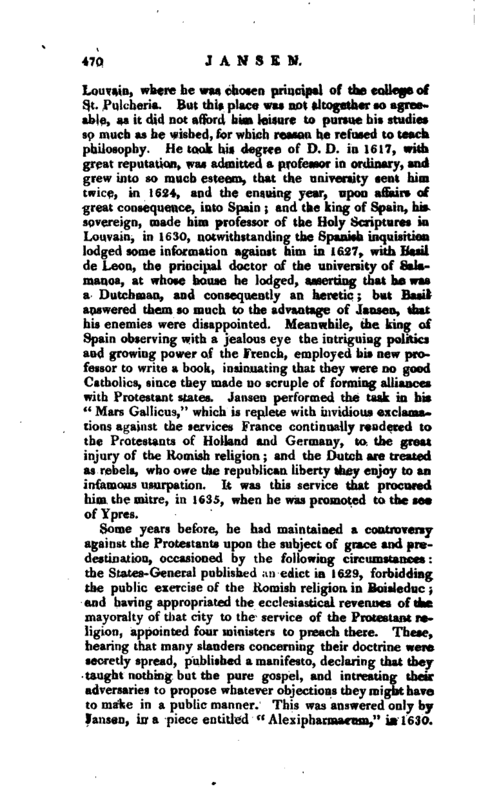 Meanwhile, the king of Spain observing with a jealous eye the intriguing politics and growing power of the French, employed his new professor to write a book, insinuating that they were no good Catholics, since they made no scruple of forming alliances with Protestant states. Jansen performed the task in his “Mars Gallicus,” which is replete with invidious exclamations against the services France continually rendered to the Protestants of Holland and Germany, to the great injury of the Romish religion; and the Dutch are treated as rebels, who owe the republican liberty they enjoy to an infamous usurpation. It was this service that procured him the mitre, in 1635, when he was promoted to the see of Ypres. 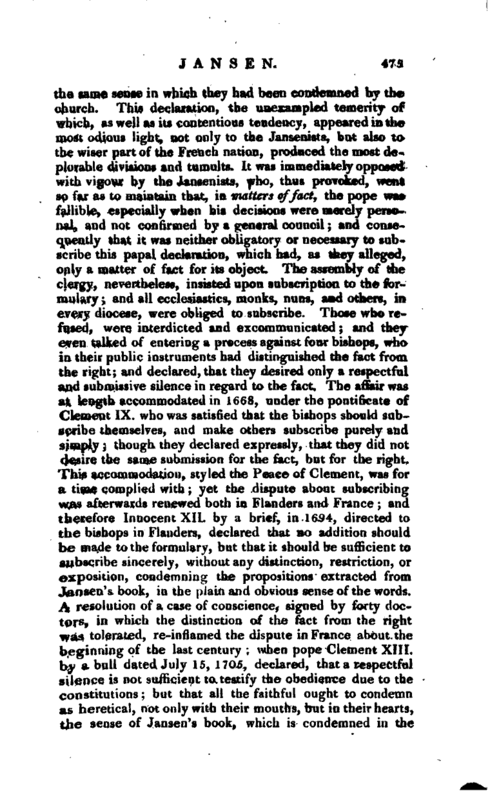 But Jansen had another war to maintain, which may be called a Protestant one; for Theodore Simonis, a wavering Roman Catholic, who wanted a master, waited upon him at Louvain, desiring him to clear up some doubts he had about the pope’s infallibility, the worship of the eucharist, and some other points. Jansen, being puzzled with this man’s objections, told him one day, that he would not dispute with him by word of mouth, but in writing; and that he saw plainly he had to do with a Roman Protestant Catholic, who would soon go to Holland, and there boast he had overcome him. Simonis, with some difficulty, complied with the proposal; but after both had written twice on the subject in question, his lodgings were surrounded with soldiers, and himself threatened with the punishment due to heretics. The duke d’Archot’s secretary exclaimed aloud against him, and said, that there was wood enough in his master’s forests to burn that heretic. 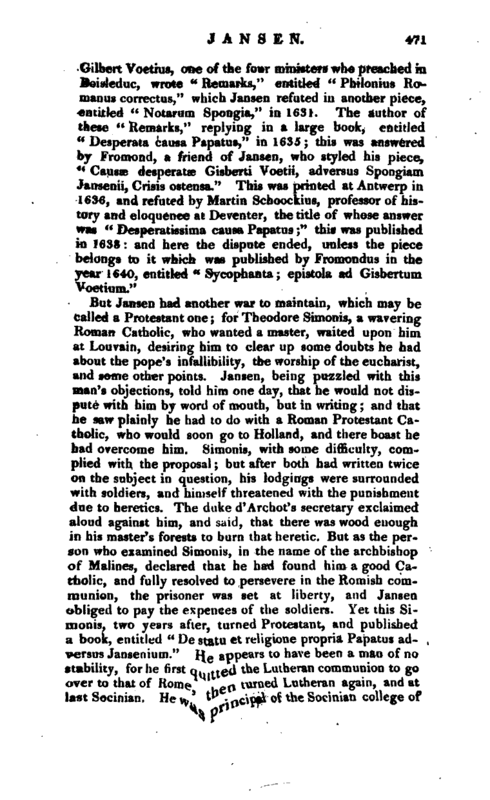 But as the person who examined Simonis, in the name of the archbishop of Malines, declared that he had found him a good Catholic, and fully resolved to persevere in the Romish communion, the prisoner was set at liberty, and Jansen obliged to pay the expences of the soldiers. Yet this Simonis, two years after, turned Protestant, and published a book, entitled “De statu et religione propria Papatus adversus Jansenium.” He appears to have been a man of no stability, for he tirst quitted the Lutheran communion to go over to that of Home, then turned Lutheran again, and at last Socinian. He was principal of the Socinian college of | Kisselin in Lithuania, was well versed in the Greek tongue, and translated Comenius’s “Janua linguarum” into that language. 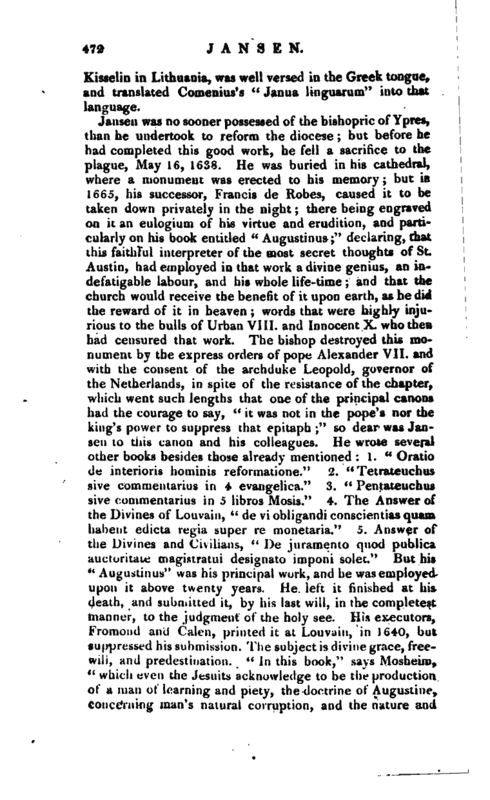 Jansen was no sooner possessed of the bishopric of Ypres, than he undertook to reform the diocese; but before he had completed this good work, he fell a sacrifice to the plague, May 16, 1638. He was buried in his cathedral, where a monument was erected to his memory; but in 1665, his successor, Francis de Robes, caused it to be taken down privately in the night; there being engraved on it an eulogium of his virtue and erudition, and particularly on his book entitled “Augustinus;” declaring, that this faithful interpreter of the most secret thoughts of St. Austin, had employed in that work a divine genius, an indefatigable labour, and his whole life-time; and that the church would receive the benefit of it upon earth, as he did the reward of it in heaven; words that were highly injurious to the bulls of Urban VIII. and Innocent X. who then had censured that work. The bishop destroyed this monument by the express orders of pope Alexander VII. and with -the consent of the archduke Leopold, governor of the Netherlands, in spite of the resistance of the chapter, which went such lengths that one of the principal canons had the courage to say, “it was not in the pope’s nor the king’s power to suppress that epitaph;” so dear was Jansen to this canon and his colleagues. He wrote several other books besides those already mentioned: 1. “Oratio de interioris hominis reformatione.” 2. “Tetrateuchus sive commentarius in 4 evangelica.” 3. “Pentateuchus sive commentarius in 5 libros Mosis.” 4. The Answer of the Divines of Louvain, “de vi obligandi conscientias quam habent edicta regia super re monetaria.” 5. Answer of the Divines and Civilians, “De juramento quod publica auctoritate magistratui designate imponi solet.” But his “Augustinus” was his principal work, and he was employed upon it above twenty years. He left it finished at his death, and submitted it, by his last will, in the completes! 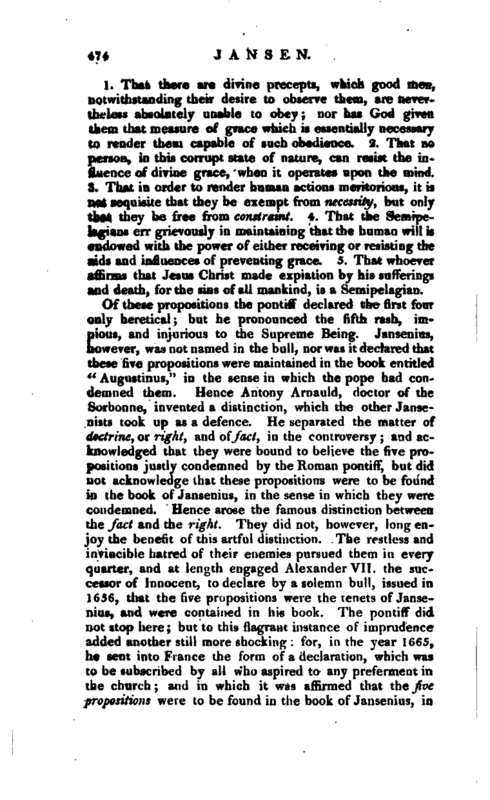 manner, to the judgment of the holy see. His executors, Fromond and Calen, printed it at Louvain, in 1640, but suppressed his submission. The subject is divine grace, freewill, and predestination. “In this book,” says Mosheim, “which even the Jesuits acknowledge to be the production of a man of learning and piety, the doctrine of Augustine, concerning man’s natural corruption, and the nature and | efficacy of that divine grace which alone can efface this unhappy stain, is unfolded at large, and illustrated, for the most part, in Augustine’s own words. 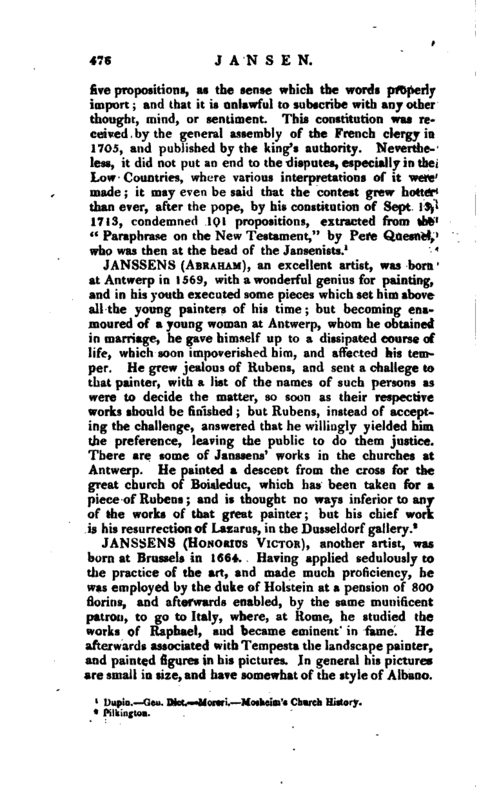 For the end which Jansenius proposed to himself in this work, was not to give his own private sentiments concerning these important points; but to shew in what manner they had been understood and explained by that celebrated father of the church, whose name and authority were universally revered in all parts of the Roman Catholic world. 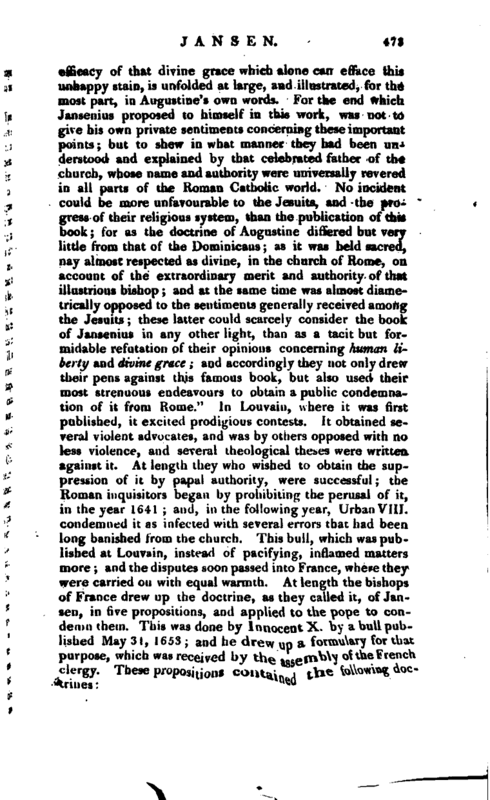 No incident could be more unfavourable to the Jesuits, and the progress of their religious system, than the publication of this book; for as the doctrine of Augustine differed but very little from that of the Dominicans; as it was held sacred, nay almost respected as divine, in the church of Rome, on account of the extraordinary merit and authority of that illustrious bishop; and at the same time was almost diametrically opposed to the sentiments generally received among the Jesuits; these latter could scarcely consider the book of Jansenius in any other light, than as a tacit but formidable refutation of their opinions concerning human li* berty and divine grace; and accordingly they not only drew their pens against this famous book, but also used their most strenuous endeavours to obtain, a public condemnation of it from Rome.” In Louvain, where it was first published, it excited prodigious contests. It obtained several violent advocates, and was by others opposed with no less violence, and several theological theses were written against it. At length they who wished to obtain the suppression of it by papal authority, were successful; the Roman inquisitors began by prohibiting the perusal of it, in Ihe year 1641; and, in the following year, Urban VIII. condemned it as infected with several errors that had been long banished from the church.This bull, which was published at Louvain, instead of pacifying, inflamed matters more; and the disputes soon passed into France, where they were carried on with equal warmth. At length the bishops of France drew up the doctrine, as they called it, of Jansen, in five propositions, and applied to the pope to condemn them. This was done by Innocent X. by a bull published May 31, 1653; and he drew up a formulary for that purpose, which was received by the assembly of the French clergy. These propositions contained the following doctrines: | 1. That there are divine precepts, which good men, notwithstanding their desire to observe them, are nevertheless absolutely unable to obey; nor has God given them that measure of grace which is essentially necessary to render them capable of such obedience. 2. That no person, in this corrupt state of nature, can resist the influence of divine grace, when it operates upon the mind. 3. That in order to render human actions meritorious, it is not requisite that they be exempt from necessity, but only that they be free from constraint. 4. That the Semipelagians err grievously in maintaining that the human will is endowed with the power of either receiving or resisting the aids and influences of preventing grace. 5. That whoever affirms that Jesus Christ made expiation by his sufferings and death, for the sins of all mankind, is a Semipelagian. Dupin. Gen. Dict. —Moreri. Mosheim’s Church History.